This new addition to our string curtain line-up has a 4" Cotton Rod Pocket. 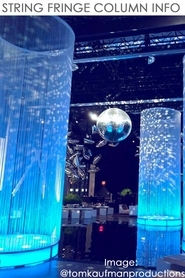 For you event planners, this means that your 2" Diameter Pipe will work perfectly for hanging. For other applications, you can use ANY type of rod or drapery hanging system including wire! It goes up just like any other curtain. This curtain is super black, and is perfect to transform your space in a dramatic way. Our string curtains have approximately 14 strings per inch. 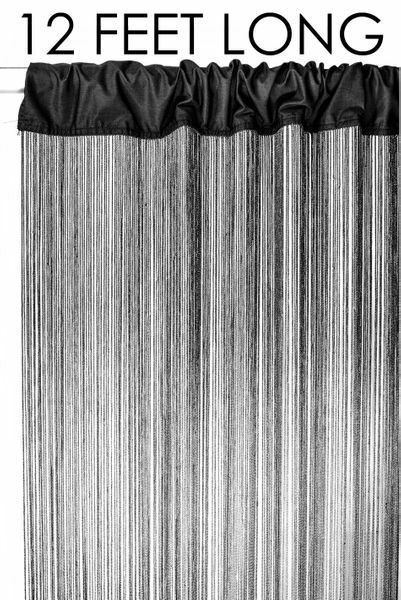 Our string curtain fringe panels are silky and elegant -- The finest quality you will see anywhere. Hang multiple panels side by side for a seamless look. Use in a doorway, in a window, or as a room divider! 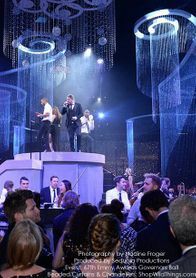 Savvy designers are using our string curtains to create chandeliers, trade show booths, to highlight or to hide room features, and to create event backdrops.